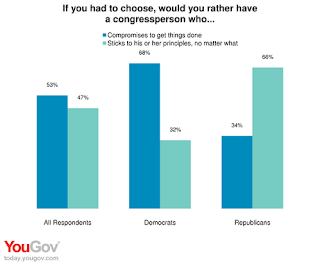 The basic lesson to take away from this is that Democrats prefer politicians who compromise to get things done and Republicans prefer politicians who stick to their principles no matter what. It seems easy, looking at this graph, to figure out how the debt ceiling debate would play out. Democrats would offer a compromise and the Republicans would reject it. Democrats would offer a compromise that was slightly more to the right and the Republicans would reject it. This would happen a bunch more times. Eventually something would happen that would change the incentives. For (most) Republicans this was the actual debt ceiling. Compromising was a better option then the US defaulting. For Democrats this seemed to be cut, cap and balance. A compromise they felt their base wouldn't support. It also seems pretty clear from this graph how the appropriations deal is going to play out. Except, i'm unsure whether or not a government shutdown looks worse to Republicans then compromise. Recently the phrase "congress is broken" has been thrown around a lot. It looks more like Congress is responding appropriately to the stated desires of their electorate. It also doesn't help that the government's structure allows a minority to prevent legislation by refusing to compromise. "It looks more like Congress is responding appropriately to the stated desires of their electorate." You mean that vast majority of people that support cuts to social security and medicare? From what I understand of the deal none of the up front cuts touch any of these programs. (i might be wrong on that, but thats my understanding) If a "super committee" deal isnt reached then the trigger automatically cuts from medicare providers, but not medicare beneficiaries, medicaid or social security. Also, the reason medicare was chosen as a "trigger" is because a vast majority of people do care about it, so its a way to try to force a deal into happening. So I guess in answer to your question, most people do not support cuts to social security and medicare, and thats why they were left out of the deal, except for the cuts to medicare providers, which are used as a way to pressure congress into making a further deal. Also, people's process preferences don't necessarily sync with their policy preferences. So people might oppose entitlement cuts but still want politicians "reasonable" enough to strike a compromise that cuts entitlements. Although I'd say that policy preferences fairly overwhelm process preferences most of the time when a voter steps into the ballot booth, which is something politicians would do well to remember. "So I guess in answer to your question, most people do not support cuts to social security and medicare, and thats why they were left out of the deal, except for the cuts to medicare providers, which are used as a way to pressure congress into making a further deal." Cuts to medicare providers is essentially a benefit cut to medicare users (makes it harder to get care), but in any case - cuts to social programs like SS/Medicare is pretty clearly what the "super congress" is all about, esp with the "under no circumstances will republican appointees agree to any deal that raises taxes." "Also, people's process preferences don't necessarily sync with their policy preferences." Yeah, that's where I was going with this. "Get things done" != "Get something done at any cost including cuts to insanely popular programs." I think (and this is with any luck), the democrats are in for a rude awakening in 2012 around this point.